Soooooo, after being thoroughly inspired by several fabulous blogs (here, here, and here), I decided to try my hand at clothing refashion. Granted, what I did is pretty basic and not exactly awe inspiring. 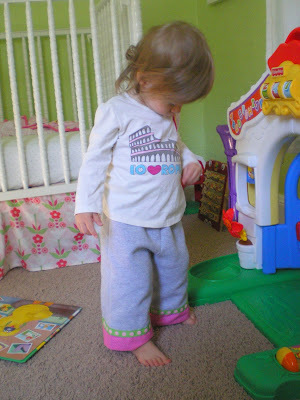 . . but I had lots of fun making Sydney some new little pants and am really happy with the result. The weather is finally getting colder here and I thought Sydney could use some warm, comfy and cute play pants. I had an old grey sweatshirt that I refuse to wear any longer, some polka dot fabric, and some snazzy ribbon. . . voila: fancy pants! 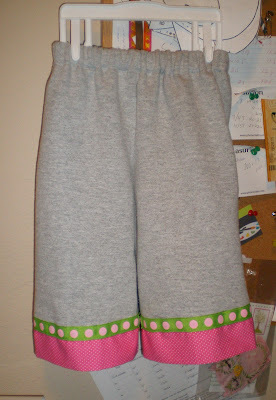 I also used my new serger to make these and only used the sewing machine to make the waistband and attach the ribbon. I am still amazed at how much faster things go when using a serger. 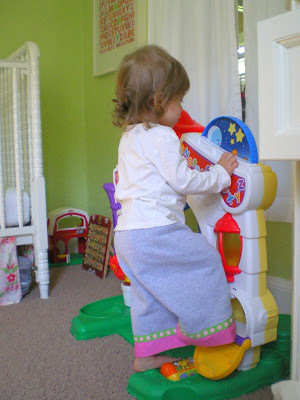 I had these pants whipped up in no time! What else did I do over the weekend? I organized! Sewing projects were taking an eternity simply because I was spending too much time digging through piles of fabric, searching endlessly for notions, and having to rearrange things to make room to work. I commandeered a plastic storage thingy from my husband's closet and bought another one. 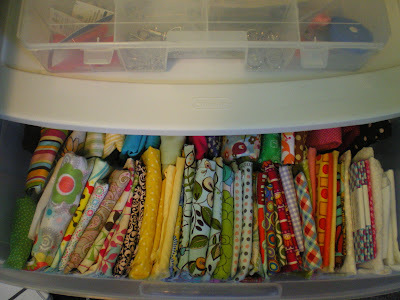 Now, I can pull out drawers to see what I have on hand fabric wise. I also found a thread and notions container on clearance and love it. Everything looks so neat and tidy. Well, other than the floor. Sewing and carpet seriously don't mesh well. Here's a sneak peak of something I started last night. I found some really awesome tutorials (free!) and will share them with you just as soon as I finish this project up and have photos to post. Enjoy the rest of your weekend! love the pants, they look so comfy! organizing every so often is a must for me, otherwise i get overwhelmed by the mess! :D and i totally know what you mean about thread and carpet. by the time i get around to vaccuming in my room, it's like another layer of thread bits. yuck! I've pretty much given up on vacuuming my sewing room. It's futile! Takes me at least an hour and one project later, it's back to the way it was before said vacuuming happened. 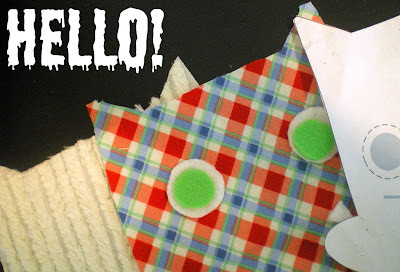 I do wish I could figure out a way to not track thread and fabric bits all over the house though!